In the book of Matthew, Jesus tells a parable about a man who spreads good seed. He uses this story to illustrate how different people receive the news of the gospel. Some of the seed that was spread fell among the thorns. These thorns, Jesus explains, represent the worries of this world and the seduction of wealth which come up to choke the Word and make a person unfruitful. We in the western world are living deep among the thorns and those thorns spring up around us to constantly try to choke the Word out of our lives and separate us from God. Our culture constantly bombards us with the message that we are only truly secure if we have a large savings account, a good paying job, and some investments stashed away for retirement. It tells us that we can only be truly happy if we have the latest stuff: a nice car, a nice house, a big television. These things, while not bad in and of themselves, are the very things that tend to distract us and lure us to take our eyes off of God and His promises and to focus instead on the promises of the world. 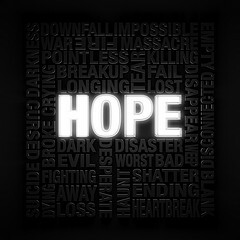 Where have you placed your hope? Do you let the thorns of this world, the want for money, prosperity, and security, along with the hectic concerns for your secular pursuits distract you from strengthening and deepening your relationship with God? Cast your concerns at His throne and seek His face in all things and help to lift up your brothers and sisters in Christ to do the same.